Essential to anybody who enjoyed their two albums to date. 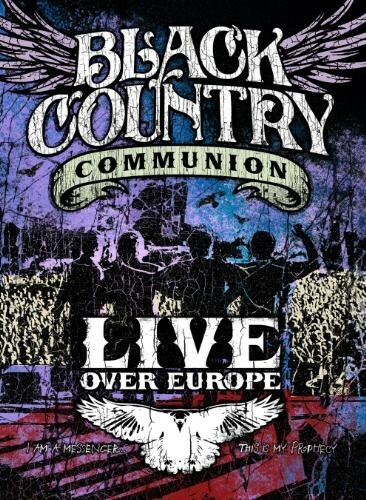 If you've spent any time reading this magazine recently, going to High Voltage, liking good old-fashioned classic rock music or generally living on Planet Earth, chances are you'll have heard of Black Country Communion somewhere. The supergroup, boasting guitar hero Joe Bonamassa, Glenn Hughes, Jason Bonham and Derek Sherinian, shook the rock world up with their debut self-titled album, which appeared in the business end of the UK album charts. With some classic hard-rocking tracks and Glenn Hughes back in full rock mode, the band quickly set about releasing their second, and in my opinion far superior, second album with a view to hitting the road: having two albums worth of material to choose from. The plan worked flawlessly and now the supergroup has been filmed on their travels for this live DVD. Initially, when I read it was filmed at different shows I thought it might look a bit disjointed. I much prefer live documents to record one night but in actuality, this works rather well, showing some performances in smaller club venues, all dark, up close and personal, to playing vast festival crowds. To BCC's credit, it doesn't matter how big the audience is, the performance rocks the same everywhere. Inevitably guitar fans will be checking out Bonamassa, but being a Hughes fan for years is what brought me to the dance, so I'll start with him. Glenn is in superb form on this DVD and best of all, his vocals are very faithful to the album versions. In the past, he has been known to scream, or in some cases, shriek, his way through an otherwise perfectly good tune. Sometimes he'd use that amazing voice to its full potential but over-sing. Not here; these are great live versions of what are on the studio recordings and therefore rate as some of my favourite performances. Bonamassa is just brilliant - playing everything effortlessly and flawlessly, his vocals complimenting those from Hughes very well. He handles lead vocals too and does a sterling job. With the immense Bonham thundering away on the drums and the refined skill of Sherinian's keyboard playing, you have a formidable quartet. All would be for naught if the songs were no good, but just about all of my favourite BCC tracks are here - the driving 'One Last Soul', the epic 'Save Me', the haunting 'Faithless', the powerhouse 'I Can See Your Spirit'... you can't go wrong. With fourteen tracks from their two albums, padded out by Bonamassa's excellent solo tune 'The Ballad Of John Henry' and the Deep Purple classic 'Burn' there really isn't any room for filler. On top of this textbook guide to classic rock, there is a bonus disk featuring a making of the DVD, plus snippets of each of the band members and producer Kevin Shirley talking. Beautifully packaged with a lavish booklet, Black Country Communion continues to drive forward with their brand of excellence. This DVD is essential to anybody who enjoyed their two albums to date.